The calendar year is full of dates that could be chosen for Holocaust Remembrance Day. Some, like January 27, the day of the liberation of Auschwitz, are recognized internationally. And, as Allied forces moved through Europe liberating Nazi death camps throughout early 1945, those dates continue to amass. So why is this Thursday, April 16, marked as Holocaust Remembrance Day in the United States and elsewhere? As the United States Holocaust Memorial Museum explains, the date corresponds with the 27th of Nisan on the Hebrew calendar, which in 1943-- on April 19 in the Western calendar-- marked the beginning of the Warsaw Ghetto Uprising. Though the date may appear to move around from year to year, it's always on that anniversary. The once-vibrant Jewish community of Warsaw was forced into a ghetto on the Jewish holy day of Yom Kippur in 1940, stuffed into an area scarcely bigger than a square mile, deprived and diminished and finally deported, as TIME's Lance Morrow explained in a review of a 2002 book of eyewitness accounts of the infamous ghetto. As the population of the ghetto dwindled, some who remained began to organize for combat. 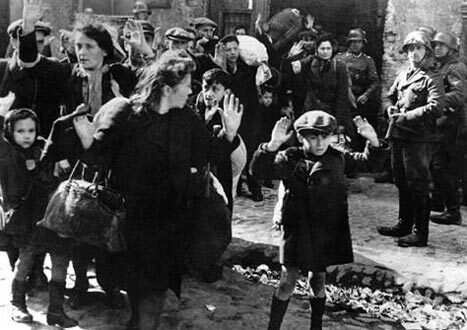 On April 19, 1943, as the Jewish holiday of Passover approached, Nazi forces entered the ghetto with the intention of sending all of its remaining residents to camps-- only to encounter the uprising. The Jews of Warsaw managed to fight back for weeks.